Today Nordea brings Apple Pay to customers in Denmark, Finland and Sweden. Apple Pay is transforming mobile payments with an easy and secure way to pay that’s fast and convenient. With 1.7 billion card transactions per year and high mobile usage in the Nordics, delivering the benefits of digitalisation to customers is a cornerstone in Nordea’s strategy. Over the last few years, Nordea has systematically built up its mobile payment services portfolio. - By adding Apple Pay to our already existing range of mobile payment solutions, we can offer our iPhone and Apple Watch customers a secure and easy to use global service that makes everyday life easier, says Topi Manner, Head of Personal Banking. Apple Pay can be used at payment terminals where the Apple Pay or contactless card symbol is visible. Customers can also use Apple Pay through many apps and online. Today, Nordea can offer Apple Pay to approximately 1.3 million mobile banking customers that are already using iOS devices every month. Security and privacy is at the core of Apple Pay. When you use a credit or debit card with Apple Pay, the actual card numbers are not stored on the device, or on Apple servers. Instead, a unique Device Account Number is assigned, encrypted and securely stored in the Secure Element on your device. Each transaction is authorised with a one-time unique dynamic security code. 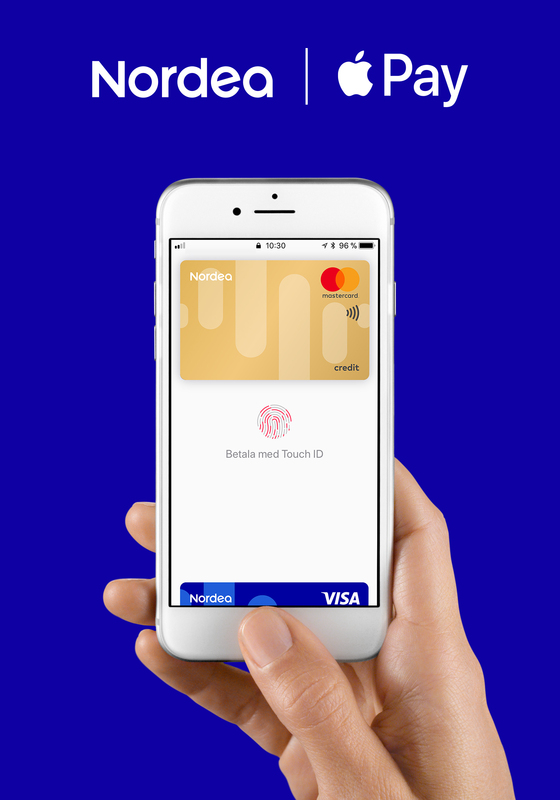 In Finland, Apple Pay will be available for Nordea customers using Visa: Nordea Electron and Nordea Debit and through Mastercard: Nordea Credit, Nordea Gold, Nordea Premium, Nordea Platinum, Nordea Black, Finnair Mastercard, Stockmann Mastercard and Tuohi Mastercard. In Denmark, Apple Pay will be available for Nordea customers using Nordea Visa/Dankort and Nordea Pay as well as Mastercard: Nordea Credit, Nordea Gold, Nordea Premium, Nordea Platinum and Nordea Black. In Sweden, Apple Pay will be available for Nordea customers using Visa: Nordea Electron and Nordea Debit and through Mastercard: Nordea Credit, Nordea Gold, Nordea Premium, Nordea Platinum and Nordea Black.